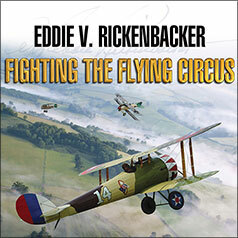 Fighting the Flying Circus is a collection of memoirs by Eddie V. Rickenbacker, a World War I fighter ace and Medal of Honor recipient, originally published in 1919. Captain Eddie V. Rickenbacker, originally from Ohio, was best known as one of the commanders of the 94th "Hat-in-the-Ring" Squadron, a crack unit of pilots that included many former members of the famed Lafayette Escadrille. The 94th ended the war in France with the highest number of air victories of any American squadron. Captain Rickenbacker later belonged to an association of pilots and Great War air veterans who, in the years immediately following the Second World War, invited many of the new "young" aces from the Pacific and European theaters for informal lectures. These men never lost their keen interest in aviation.